A late model Cadillac Escalade ESV is a complete transportation solution. Make the first impression count with a dominating and aesthetically refined vehicle that symbolizes your determination to settle for nothing then the extraordinary. This vehicle is sure to provide smooth travels, privacy and efficient transportation upto 7 passengers and lots of bags from Hamilton To Pearson Airport or any other place. The Ford Excursion Entended-Length Sub-Urban-Vehicle is a substantially convenient option if you prefer more legroom for a higher number of passengers as well as more amenities as compared to standard limo options while traveling from Hamilton to Pearson Intl Airport or Toronto. With a very comfortable interior and multimedia facilities; the Ford Excursion EL SUV can get you to most places a standard low riding Limo cannot. Travel in absolute style and class in a vehicle that can carry up-to twelve passengers easily. The Extended Lincoln Town Car is a classic of premium transportation. With offerings such as spacious accommodation for up to eight passengers, efficient air-conditioning system, leather seats, exclusivity options and additional premium options. 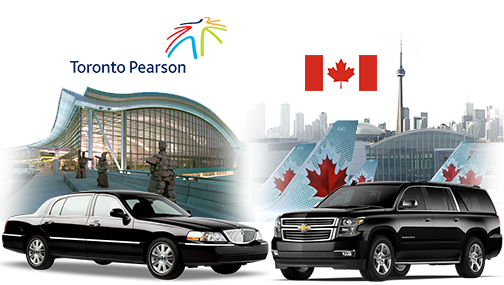 Travel in style from the Hamilton Airport to anywhere in Canada in a comfortable town car. Affordable, secure and convenient, our L series Sedans are the perfect choice for homesick travelers who value their time. Lincoln L series Sedan can carry up to 4 passengers, five pieces of luggage and with a spacious interior, private cabin as well as black leather upholstery, this vehicle is sure to get you to the Hamilton Airport Departure Terminal on time, hassle-free and comfortable.